The state, the market and the voluntary non-profit sectors can be seen as each being characterized by a distinctive accountability regime. 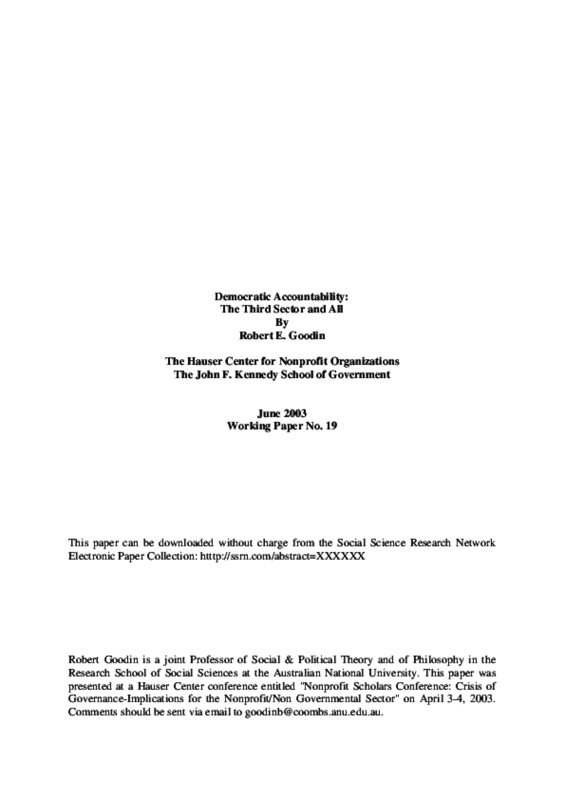 Those regimes focus on different subjects of accountability (actions, results and intentions, respectively) and on different mechanisms of accountability (hierarchy, competition and cooperative networking, respectively). Different regimes can complement one another, enhancing the democratic accountability of the system overall. They can also undercut one another, if their differences are not respected. Bringing the Third Sector under a market-style accountability regime, through 'public-private partnerships' based on competitive tendering, undermines the distinctive contribution that the Third Sector might make. This publication is Hauser Center Working Paper No. 19. The Hauser Center Working Paper Series was launched during the summer of 2000. The Series enables the Hauser Center to share with a broad audience important works-in-progress written by Hauser Center scholars and researchers.